Whether you need to gain awareness of your surroundings when driving your van, RV, or truck, the Box Truck Backup Camera System (7" Mirror with 120° RV Backup Camera) is an ideal, simplistic way to go. Complete with a 7” monitor and durable camera, this system can withstand any adventure you dream up. View everything your camera captures in rich, vivid color with the 7” mirror monitor that is quickly installed by simply clipping it to your existing rearview mirror. Two video inputs also allow you to use this monitor to view DVDs or connect your favorite gaming console. The commercial box camera included in this set was created with the adventurer in mind and built tough for longevity and reliability. With a 120° viewable angle, this piece of equipment gives you the pair of extra eyes you sometimes need when backing up, parking, and making lane changes. The durable design maintains operation even when hit by a rock or drenched in a torrential rainstorm. A 35 foot cable is included with the camera, with the additional option to go wireless with one of our convenient battery packs. 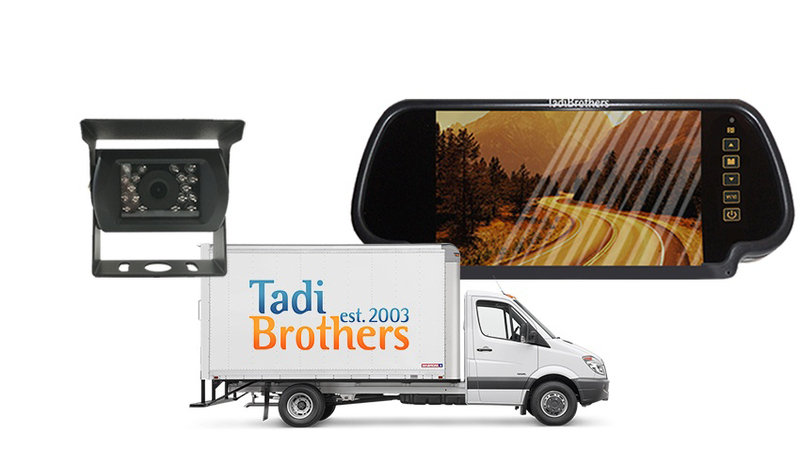 Tadi Brothers are committed to making each drive safer and easier for our clients by providing systems such as the Box Truck Backup Camera System (7" Mirror with 120° RV Backup Camera). We are so confident that you will love your new system that we offer a 30 day 100% money back guarantee and technical assistance anytime, any day. Shop Tadi Brothers today to see the world behind you! This item includes a 35 Foot cable, if it's going on an RV, BUS or any other vehicle longer than average SUV we recommend upgrading to our premium extension cables located on the top left of the page. "I was so impress on how easy this mirror was to install. I was recently going to have someone else do the installation but I went ahead and it myself. Easy!" "We got this before going to camp. I like it because I can see it all back behind and what I tow. So its a really a plus on our first trip"
"I like this because it saves my dash space. I didnt want it on the dash and I like that its a reflection like a mirror. Great job"